Today, Patrick and Taylor are discussing Punisher 4, originally released April 2nd, 2014. Patrick: I can’t think of a superhero with a more troubling psychological origin story than Frank Castle. The circumstances are as cliche as they come: Frank’s family is murdered, driving him to take revenge on those responsible. But Frank’s able to abstract that responsibility and extend it to All Criminals. Very pointedly, he is not an agent of justice, and he’s not looking to make anything right — his goals and his ideology are so neatly wrapped up in his code name. Punisher. Obviously, his approach requires a horrifically oversimplified view of criminals, there’s no room for mercy or subtlety. But that also means there’s no room for complication: Frank’s MO is too pure for corruption. 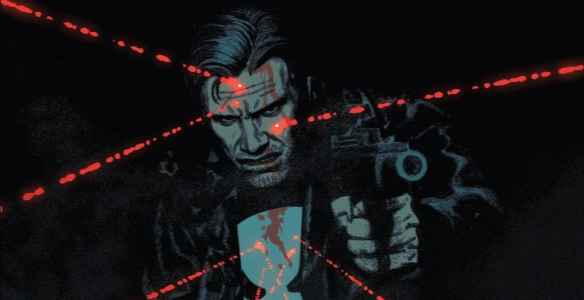 The world around Punisher isn’t so simple, and as issue four simultaneously focuses in Frank’s character and broadens out to illuminate his world, it’s clear that he’s up against threats on a scale totally inappropriate for a street-level executioner. Today, Spencer and Greg are discussing Punisher 2, originally released February 19th, 2014. Spencer: As Frank explains in Nathan Edmondson and Mitch Gerads’ The Punisher 2, there’s a strata of villains too big for the cops to handle, but not big enough for the superheroes to take notice of. This is the league of villains the Punisher usually goes up against — the kind that can give him a proper fight — but it looks like all that’s about to change. Not only are the Howling Commandos on Frank’s tail, but the Dos Soles gang also has a powerful new weapon that’s out of Frank’s usual league; this is some definite superhero-level business Punisher’s got himself tangled up in here. Today, Drew and Spencer are discussing Punisher 1, originally released February 5th, 2014.